The twenty-two mile River Road National Scenic Byway extends westward from Lake Huron into the Huron National Forest. It parallels the historic Riviere aux Sable (River of Sand). The Au Sable River was a major transportation route for floating Michigan’s giant white pine from forest to the sawmill towns on Lake Huron. You can learn more about this lumbering history at Lumbermen’s Monument Visitor Center that sits at the center of the byway. Byway travelers will find abundant recreation opportunities, from motorized trails for off-road vehicles and snowmobiles to quiet trails for hiking and cross-country skiing. Camping, fishing and boating facilities are accessible from the byway. For a more relaxed experience, visitors will enjoy the lush forest and breathtaking vistas from the many scenic overlooks along the route. Visit www.byways.org for more information. For information on Lumberman's Monument, Monument Campground or the Visitor Center visit the Lumberman's Monument section of the website. No permit or reservation is required outside of the permitted season. Camping Permit required at primitive campsites from May 15 to September 10. The path to the observation area and monument is paved and over 36" wide. The path to the observation area is paved and over 36' wide. The observation deck is paved. Interpretive signage and restroom facilities at the top of the stairs are fully accessible. The parking area is gravel/dirt. The monument sits in a grassy lawn type area. The observation deck has wood deck planking. Interpretive signage and restroom facilities are fully accessible. Travel west on River Rd. for 18 miles. Travel west on River Rd. for 10 miles. Site is located on the right. Turn right and travel north on M-65 for 18 miles. Turn right and travel east on River Rd. for 1 mile. Travel west on River Road for 17 miles. Travel west on River Rd. for 15 miles. Turn left and travel south on Monument Rd. for .25 miles. The site is on the left. Turn left and travel west on M-65 for 4 miles. Foote Pond Overlook provides visitors with views of the Au Sable River and Foote Pond, created by the Foote Pond Dam. Rollways Campground was built in 1909 and was one of the first campgrounds established on the Huron National Forest. The pull-through campsites accommodate large motor homes and trailers. Monument Campground, established in 1909, was one of the first campgrounds built on the Huron National Forest. Monument Campground is a fully accessible camping area within a red pine plantation. This campground is located on River Road National Scenic Byway and is adjacent to Lumberman's Monument Visitor Center. For more information visit the Monument Campground site page. Eagle Run Trail is a 6.8-mile trail that runs along the south shore of the Lower Au Sable River. The trail provides a loop trail system for hiking and cross-country skiing. Scenic views of the Au Sable River and a quiet, remote setting allow visitors to experience nature first hand. The trails are maintained with the support of volunteers. Highbanks River Trail is a 7-mile, scenic back-country linear trail system with views of the Au Sable River Valley. From high bluffs of the south shore of the Au Sable River, many species of plant, animals and songbirds may be viewed in their natural setting. For more information visit the Highbanks Trail site page. Forest Discovery Trail is a short, .6-mile, hard-packed trail that goes from the Visitor Center to an observation deck. A loop of the trail has interpretive signing. This trail is not paved, but may be accessible for wheelchairs and strollers. For more information visit the Lumberman's Monument Visitor Center site page. There are many areas on the forest for scenic viewing. Use the right tools - A field guide, a pair of binoculars and a camera. Wear clothing that is appropritate for the season and activitiy. Do not feed the wildlife - There is plenty of food availale in the wild. Human food can cause digestive problems, provide improper nutrition, and even kill an animal. An online version of the Michigan Wildlife Viewing Guide is available on the MI-DNRE website. Iargo Springs provides a panoramic view of the Au Sable River. Used as a drinking water source since pre-settlement times, dams were constructed on the springs by early loggers before the turn of the century. The dams were useful in diverting water to the logging camps nearby. Most of Cooke Pond was dry land then. Europeans have visited the springs for recreation since the 1920s. A trail to the springs was constructed by the Civilian Conservation Corps in 1934. Early photographs show the dam being repaired and reinforced by the CCC's. The dams lasted until 1981 when a storm took them out. The site was renovated in 1991. Steps were added and boardwalks along the springs, as well as the dams being rebuilt. Lumberman’s Monument Visitor Center interprets the area’s colorful lumbering past. The 14-foot Lumberman’s Monument stands on a high bank with the Au Sable River providing a scenic backdrop. Two observation decks provide panoramic views of the Au Sable River. For more information visit the Lumberman's Monument Visitor Center site page. 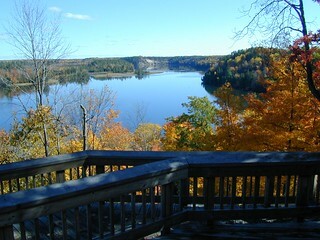 Foote Pond Overlook provides visitors with views of the Au Sable River and Foote Pond, created by the Foote Pond Dam. Habitat for eagles is visible from this vantage point, and visitors may have an opportunity to view eagles or other wildlife. This is also a spectacular location to view fall colors. Canoer's Memorial honors those that have paddled and those that continue to paddle these flowing waters. The site provides views of the Au Sable River. Access to Highbanks Trail during summer months is available at this site. Westgate Overlook is a great location to view the river and see fall color. There is a short, half hour walk on a limestone path to the Rollways Day Use area. Westgate features a kiosk that provides information on the Au Sable River and River Road National Scenic Byway. Wildlife abounds and visitors will have many opportunities to see the varied bird life of the area, particularly trumpeter swans and eagles. Kiwanis Monument commemorates the efforts of private citizens in the reforesting of Michigan's barren lands. Set admist the forest, visitors will catch a glimpse of the rewards of those efforts. Rollways Campground was built in 1909 and was one of the first campgrounds established on the Huron National Forest. The pull-through campsites accommodate large motor homes and trailers. The day use area is adjacent to the Rollways Campground. There is a short, .5 hour walk between the day use site and Westgate Scenic Overlook. For information on motorized boating, visit the Au Sable River page. For information on non-motorized boating, visit the Au Sable River page.